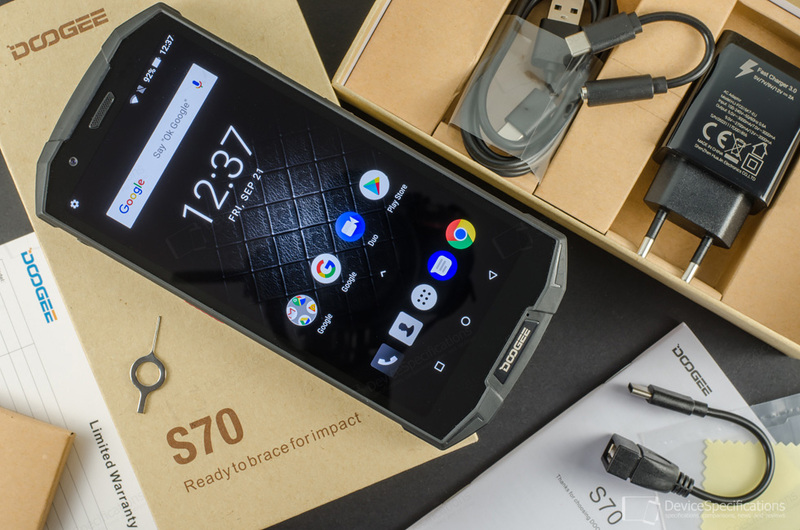 Doogee S70 has been designed by Doogee Spain and developed by China-based Shenzhen KVD Communication Equipment Limited. It has been created to become the world's first gaming rugged smartphone, offering reliable gaming experience and withstanding any outdoor or indoor environmental challenge. 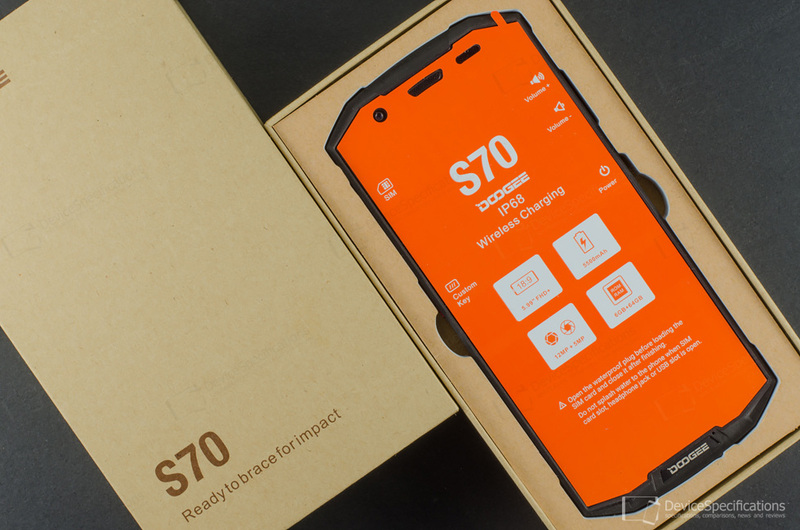 We've received a Doogee S70 unit for review and we're very excited about it for a number of reasons. First, the BL and S lines of Doogee smartphones together with the Mix series showed that this manufacturer aims to provide quality products at affordable prices and actually manages to do so. Secondly, this is the first rugged smartphone that is built for gaming and not only this - the first mid-range gaming smartphone. Thirdly, this smartphone is funded via Indiegogo and quite successful that is, if you're looking at the stats. Currently, the device is in the mass production stage and it is expected it will hit the stores in November. So, here's our in-depth review of the Doogee S70, which adds one more to the usual 10 pages that discusses the Doogee G1 gamepad and the gaming experience with the S70. You can buy Doogee S70 at a promotional price here. Doogee S70 is built around a 5.99-inch IPS display from LG with an FHD+ resolution (1080 x 2160 pixels) and a Corning Gorilla Glass 4 for protection. The body has all features typical for a ruggedized handset and is IP68, IP69K and MIL-STD-810G certified. For a pinch of luxury, the backplate is covered with real leather. The smartphone is equipped with a 5500 mAh battery that supports MediaTek's Pump Express 3.0 and is coupled with a 12V/2A fast charger. It also supports Qi wireless charging (5W/10W). A MediaTek Helio P23 (MT6763T) chipset ticks under the hood using an octa-core Cortex-A53 CPU with four 2.34GHz Cortex-A53 cores and four 1.79GHz ones. A dual-core 770MHz Mali-G71 MP2 GPU manages the graphics department. The model features 6GB of dual-channel LPDDR4X RAM clocked at 1600MHz and 64GB of eMMC 5.1 internal memory that can be expanded with up to 128GB. The camera department includes two rear shooters and a front-facing snapper with face unlock. The main rear camera packs a 12MP Sony IMX363 Exmor RS sensor paired with an f/2.8 lens, dual-tone LED flash and dual PDAF. The auxiliary rear camera is equipped with a 5MP sensor for shooting in SLR mode. On the front, a 16MP Samsung S5K3P9SP camera sits combined with an 80-degree lens with an f/2.8 aperture and face unlock support. The smartphone supports 2G GSM (850, 900, 1800, 1900 MHz), 2.5G CDMA (800, 1900 MHz) 3G WCDMA (850, 900, 1700, 1900, 2100 MHz), and 4G LTE-FDD (700 MHz Class 17, 800, 850, 900, 1700/2100, 1800, 1900, 2100, 2600 MHz), 4G LTE-TDD (700, 2000, 1900, 2300, 2500, 2600 MHz) network bands with LTE Cat. 7 speeds. Both SIM cards on the dual Nano-SIM/microSD slot support 4G LTE. The wireless connectivity options include dual-band Wi-Fi 802.11 a/b/g/n, Wi-Fi Hotspot, Wi-Fi Direct, Wi-Fi Calling, and Bluetooth 4.0. The device is equipped with a rear-mounted fingerprint sensor, a USB Type-C 2.0 port with OTG support and lacks a 3.5 mm jack. It runs on Android 8.1 Oreo with Doogee OS 2.0 on top including a special Game Mode. We have received an extended package that also includes a second box housing the Doogee G1 gamepad and Doogee's 5th Anniversary Medal designed by the world-renowned German designer Chris Von Neumann, a judge at the German Red Dot Design Competition. 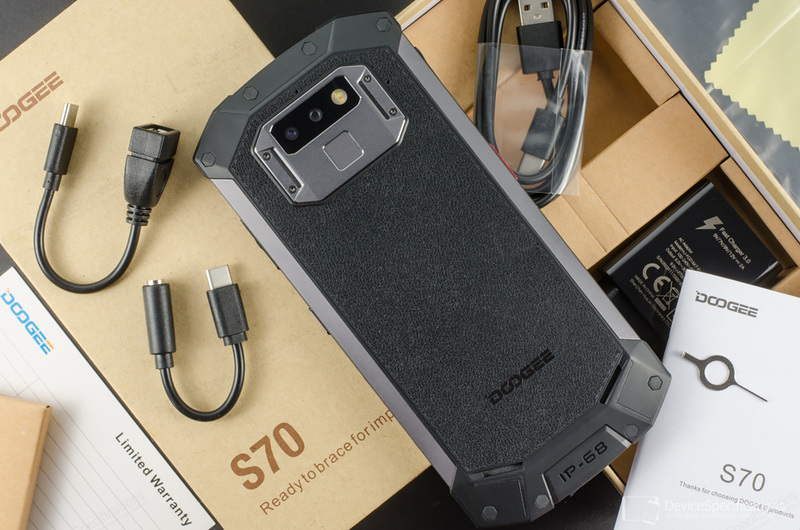 Doogee S70 supports wireless charging and you can also obtain as an option the W2 wireless charger that's made of metal and leather.